It's a hole-in-a-wall place, a bit off the main street. Slowly but surely, winter is coming. A gust of wind on my face makes my cheeks and nose turn red. We first visited Ultramen on a hot, humid day in the middle of summer (bit of a mistake, perhaps) and while it was good, we wanted to wait for cooler weather before going back for our follow-up visit. Yesterday was just that kind of day. Now, the name is supposed to sound like Ultraman (you can tell by the decor) but with -men (the Japanese character meaning noodles), and while they do sound the same in Korean, the two sounds are very different to English speakers and the joke is lost. Try not to let this bother you too much. The restaurant was empty when we arrived, but probably because we went very early (Aaron has Korean class at 6:30, so we ate around 5-5:30). 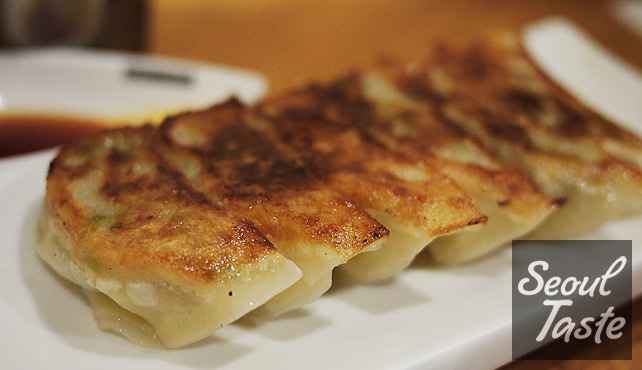 When we entered, a woman was sitting at a table making gyoza. 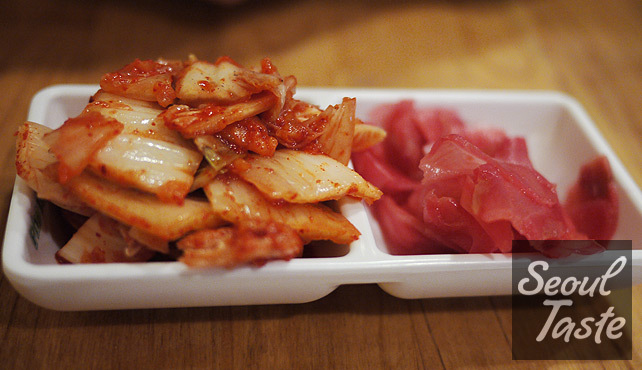 She brought over kimchi and pickled ginger containers from the fridge and took our order. I ordered tonkotsu shoyu ramen with extra chashu topping for me and miso ramen with extra vegetable topping for Aaron, and a side of gyoza to share. You can order regular or "deeper-flavored" soup, but we're still not sure what the difference is (we'll have to do a serious side-by-side comparison next time). The restaurant is small and cozy. 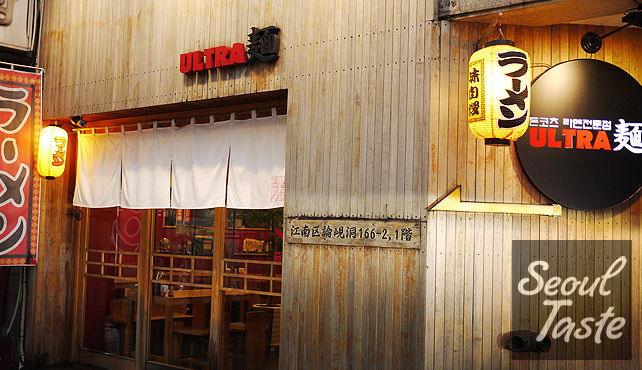 One wall is decorated with giant mural of ramen and rest is painted in bright red, and there are many different Ultraman action figures strewn throughout the shop. I have just a few minutes to nibble on the kimchi and pickled ginger before two impressive bowls of ramen arrive at the table. Even before I eat my ramen, I take a spoonful of Aaron's miso ramen to taste the soup. It has a rich flavor of pork with Japanese miso. 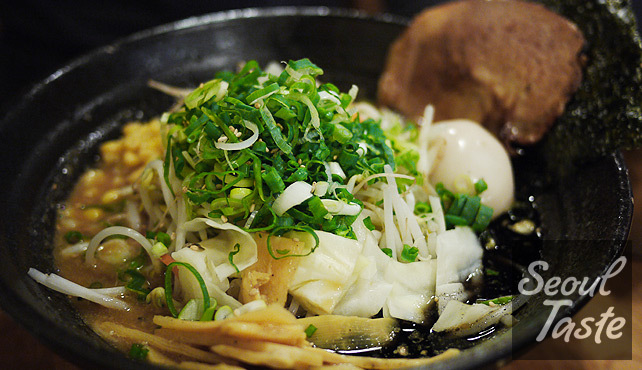 Basic ramen comes with a slice of chashu pork, wild black mushrooms, bamboo shoots, a piece of nori (dried seaweed), mung bean sprouts, leeks and soft boiled egg (in typical Japanese style, the whites are just barely cooked and the yolk is still runny). Extra vegetable toppings include cabbage, carrots and an extra handful of mung bean sprouts. My shoyu ramen is delicious, also with a full pork taste flavored with soy sauce. The two tonkotsu soups were definitely different, but both so good that I couldn't choose one over the other. Extra chashu pork topping on my bowl ensures I have three more slices of pork goodness. The rich soup was a perfect match for the cold weather. Gyoza arrived soon after. The six piece set is just right for two people to eat alongside the ramen. This would also go great with a beer or two, but it wouldn't be good for Aaron to go to class red-faced. Within 10 minutes, our bowls are emptied. As we head out and the gyoza-making woman comes to clear our table, she notes, happily, that we've completely cleaned our bowls and plates. I could see from her face that it was more than just a polite comment from a server. No, it looked like the proud face of the owner. I like that. 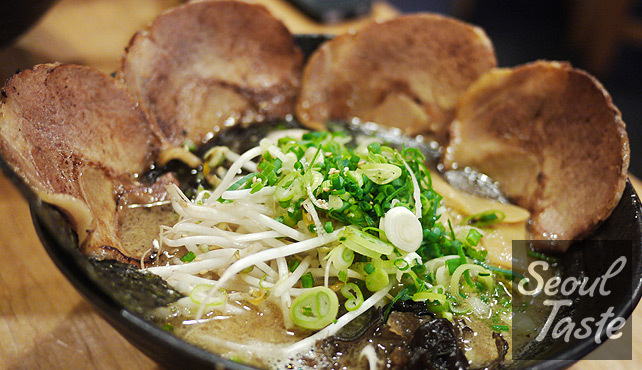 Food: 4/5 - Delicious bowl of ramen to warm you up on cold nights. Taste of the ramen feels consistent. Service: 4/5 - No complaints here. It feels like they are a family business, very comfortable. Atmosphere: 4/5 - Nice and cozy place with kitschy decor.